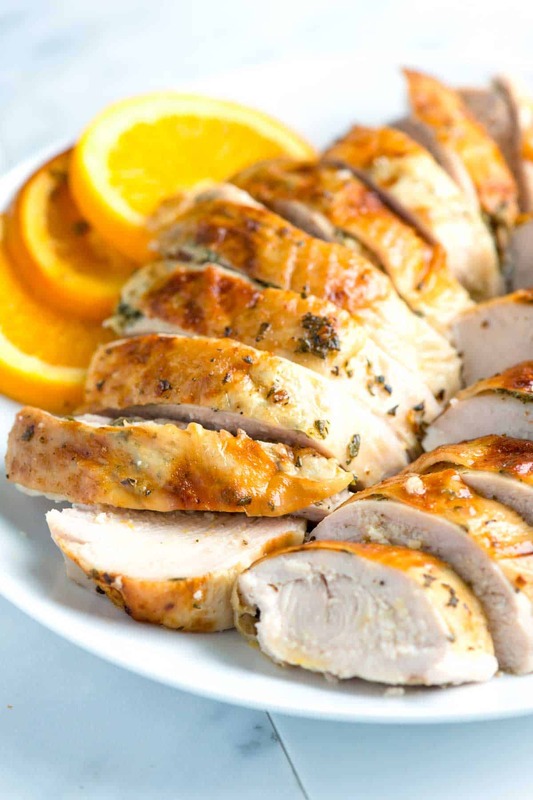 How to make perfectly juicy oven-roasted turkey breast with garlic, herbs, and orange. 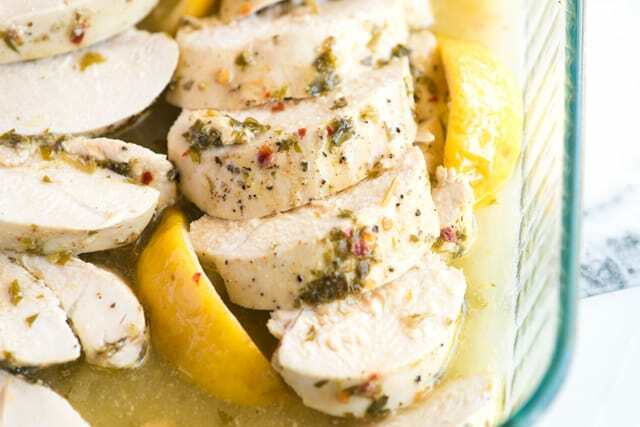 Jump to the Garlic Herb Roasted Turkey Breast Recipe or read on to see our tips for making it. We love roasting turkey breast. It’s much quicker to make than a whole turkey, but will still easily serve six. It’s unbelievably moist and juicy, too. 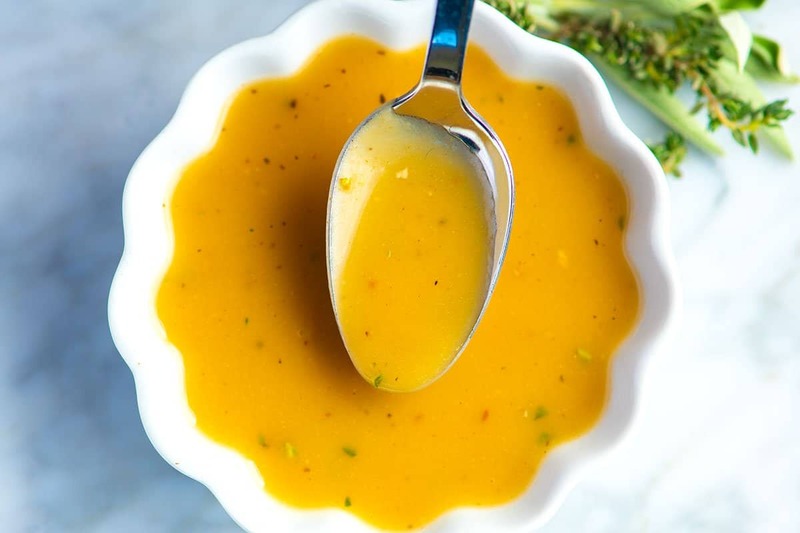 You can play around with the flavors, but our recipe calls for the classics – mustard, garlic, rosemary, sage, and orange. We absolutely love it. It’s simple, beautiful and perfect for sharing with family. YOU MAY ALSO LIKE: If you’ve been searching for a baked chicken breast recipe that guarantees chicken that’s juicy, tender and flavorful then let us introduce you to this Lemon Garlic Baked Chicken Breast Recipe. How To Make the Juiciest Turkey Breast Ever! We’ve found that bone-in turkey breasts are a little easier to handle than whole turkeys. When we’re cooking for smaller numbers, they’re perfect and will feed 6 to 7 people, allowing for some leftovers. For this recipe, you will need a 6 1/2- to 7-pound bone-in turkey breast. Make sure it’s completely thawed. If you cannot find a fresh, unfrozen turkey breast, you will need to thaw it. To do this, buy the frozen turkey breast 2 days in advance then thaw breast side up, unopened on a baking sheet in the fridge. If you are in a rush, you can also thaw the turkey in cold water — this is much quicker. Thaw breast side down, unopened, with enough cold water to cover the turkey completely. Change the water every 30 minutes until it is completely thawed. A 7-pound turkey breast will take about 3 hours to thaw using the water method. For more information, take a look at Butterball’s tips for thawing turkey. It’s easiest to use a roasting pan with a rack. Since we’re only roasting the breast it can be a little unstable. The rack helps keep turkey breast stay upright. It is possible to roast turkey breast without a roasting pan and rack. In our photos, you’ll notice we used a baking dish without a rack. You can do this, as well. Use a dish that just fits the turkey breast, place it into the dish then if you find it to be unstable, use slices of orange to prop the breast up a little so it stands tall. (Instead of orange slices, try lemon or onion slices or even carrots). Roast the turkey breast in a 325-degree F oven for 1 1/2 to 2 hours. The meat will be moist and juicy and the skin golden brown. We love lots of flavor so we rub the turkey all over with a paste made from olive oil, Dijon mustard, garlic and lots of herbs. Here, we’re using rosemary, thyme and sage. You could do the same or just use one herb. Some orange zest added would be delicious, too. Try swapping fresh garlic for roasted garlic! Roasted garlic is one of the best things you can make in your oven. Here’s how we roast garlic as well as lots of ways to use it: Jump to the Roasted Garlic Recipe! We like to rub the garlic-herb paste all over the turkey — even under the skin covering the breast. You want it everywhere. (We find our hands are the best tools for this, if you’d like, use a pastry brush or small spoon instead). 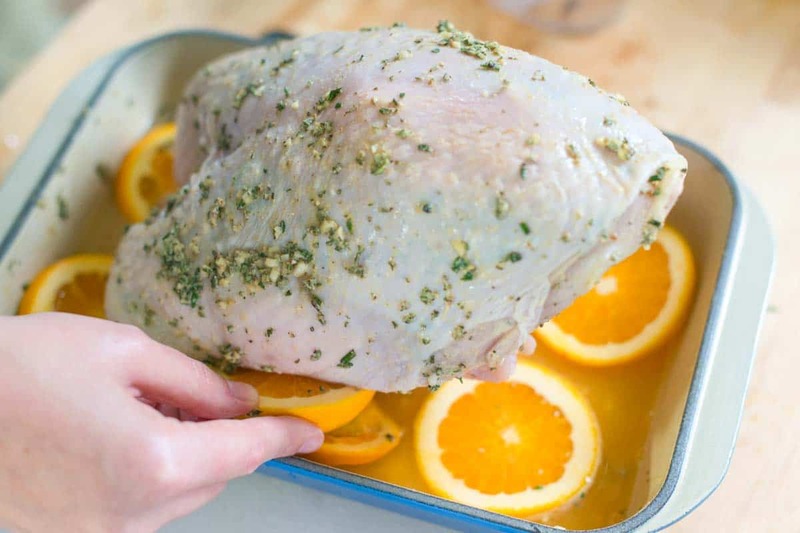 Once the turkey is completely rubbed down, pour orange juice and chicken stock into the pan along with a few slices of orange and slide into the oven. Look for the poultry herb packet sold in stores. It has the perfect amount of each herb for this. The packet usually has all three herbs included and is cheaper than buying three separate packets. We love serving the turkey off the bone. To do this, carefully cut each breast of the bone then slice into thick slices. The orange juice and chicken stock added to the pan for roasting is also wonderful spooned over the turkey slices. Enjoy! YOU MAY ALSO LIKE: Serve this silky smooth gravy next to the turkey. The gravy takes less than 10 minutes and works wonders drizzled over perfectly juicy turkey breast! 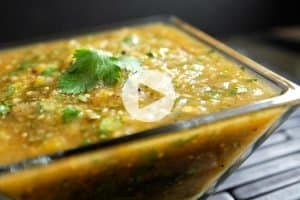 See the Quick and Easy Gravy Recipe. We have lots of side dishes on Inspired Taste, the following recipes compliment roasted turkey very well. Cinnamon Roasted Butternut Squash Recipe – Butternut squash is roasted until tender and lightly caramelized. Cinnamon and cayenne add warmth while brown sugar sweetens things up a little. Roasted Carrots with Parsley Butter – Roasted carrots are sweet, tender and completely delicious. In this recipe, we toss them with a garlicky, parsley-laced butter. Shaved Fennel and Arugula Salad – This salad is crunchy, fresh, and light. There is orange juice in the dressing, so this is perfect with the turkey. Roasted turkey breast is quicker to make than a whole turkey, but will still easily serve six. It’s unbelievably moist and juicy, too. It’s easiest to use a roasting pan with a rack. Since we’re only roasting the breast, the rack keep the breast upright. It is possible to roast turkey breast without a roasting pan and rack. In our photos, you’ll notice we used a baking dish without a rack. You can do this, as well. 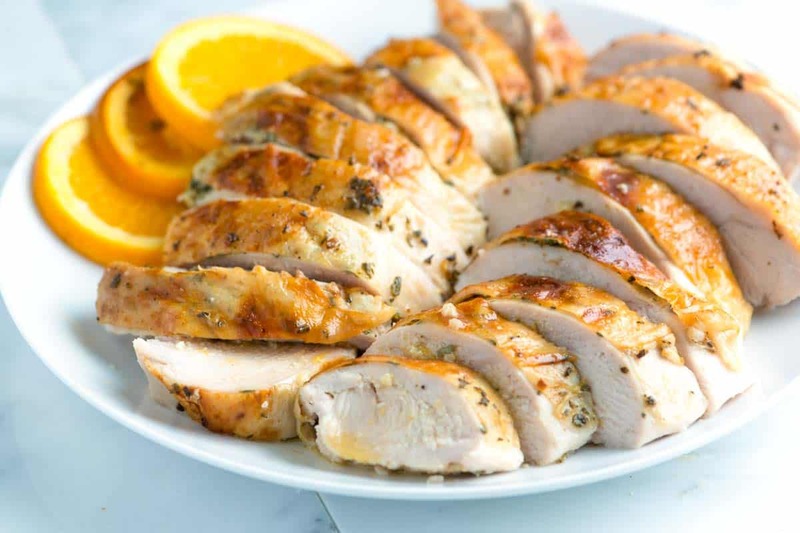 Use a dish that just fits the turkey breast, place it into the dish then if you find it to be unstable, use slices of orange to prop the breast up a little so it stands tall. (Instead of orange slices, try lemon or onion slices or even carrots). Put turkey breast, skin-side up in a heavy roasting pan or baking dish, preferably on a rack. (If you do not have a rack, you will need to cushion and prop the turkey breast up with orange slices later so that it is stable). Stir garlic, rosemary, thyme, sage, salt, pepper, olive oil, and the mustard together to form a paste. Use your fingers to lift the skin away from the breast meat and spread half of the paste directly on the meat. Smear the remaining paste all over the outside of the turkey. Pour the orange juice, lemon juice, and chicken broth into the bottom of the roasting pan. Scatter orange slices around the pan and if needed, use a couple slices to prop the turkey breast upright so that it is stable. Roast the turkey for 1 1/2 to 2 hours, until the skin is golden brown and an internal thermometer registers 165 degrees F when inserted into the thickest part of the breast. (It’s best to check more than one location to be sure). If, while it roasts, you notice the turkey is browned more than you’d like, cover the turkey loosely with aluminum foil and continue to roast until done. When the turkey is done, remove from the oven, cover with aluminum foil, and allow it to stand at room temperature for 10 minutes. Pour the juices left in the roasting pan into a small jug and skim any fat from the top. Slice the turkey and serve with the pan juices spooned over the top. If you cannot find a fresh, unfrozen turkey breast, you will need to thaw it. To do this, buy the frozen turkey breast 2 days in advance then thaw breast side up, unopened on a baking sheet in the fridge. If you are in a rush, you can also thaw the turkey in cold water — this is much quicker. Thaw breast side down, unopened, with enough cold water to cover the turkey completely. Change the water every 30 minutes until it is completely thawed. A 7-pound turkey breast will take about 3 hours to thaw using the water method. Nutrition Facts: The nutrition facts provided below are estimates. We have used the USDA Supertracker recipe calculator to calculate approximate values. We assumed 6 servings, which means 6 very generous portions. You will likely have leftovers. This recipe looks great. 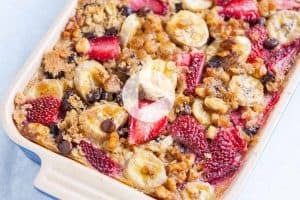 I have a group of 14 people so would I need to make two of these recipes as listed above? Meaning if I put two 6-7 lb turkey breasts in the oven, do I need to double the cook time if using the same directions? Hi Anthony, The cook time should not be too different. I’d just keep an eye on the turkey and rotate a few times for even browning. My family and I are not big turkey fans. Even though, I’ve baked some good ones in the past. 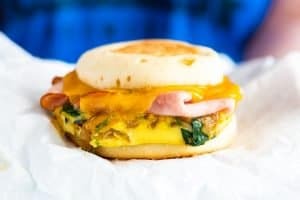 However, this recipe looks absolutely delicious!! I can’t wait to try it!! What are your thoughts on using an oven bag? Will it affect cooking time? Hi AK, I’d imagine the oven bag would take a similar amount of time. Looks delicious! I live in a high altitude area 7350 feet. Do I need to adjust the temperature like 350 or the cooking time in order to have a juicy turkey breast? I would keep the temperature at 325F. You might want to consider adding a little more liquid to the pan or fill another pan with several cups of water and place it on a lower rack. This will create more steam while the turkey roasts and should help to prevent it from drying out. Basting occasionally with the cooking liquid is a good idea, too. I am thinking about using this recipe on bone in skin on chicken breast. I thinking about an hour but not sure if this is enough time for skin to brown? Loved to have your thoughts. I am new to your site and I feel comfortable that you do not share e-mail info with others. Thank you and looking forward to trying your recipes. Hi Cheryl, That should be plenty of time for the skin to brown. Here’s a link to our whole chicken recipe, you can see that we roast it around 425 degrees F for 1 hour. Just the breast will likely take slightly less time. Joann this recipe sounds great. Would I be able to use the breast without the bone in it? Hi there, you can but will need to consider cooking time. Boneless turkey breast will take less time. The photo is as good as the turkey breast tastes. 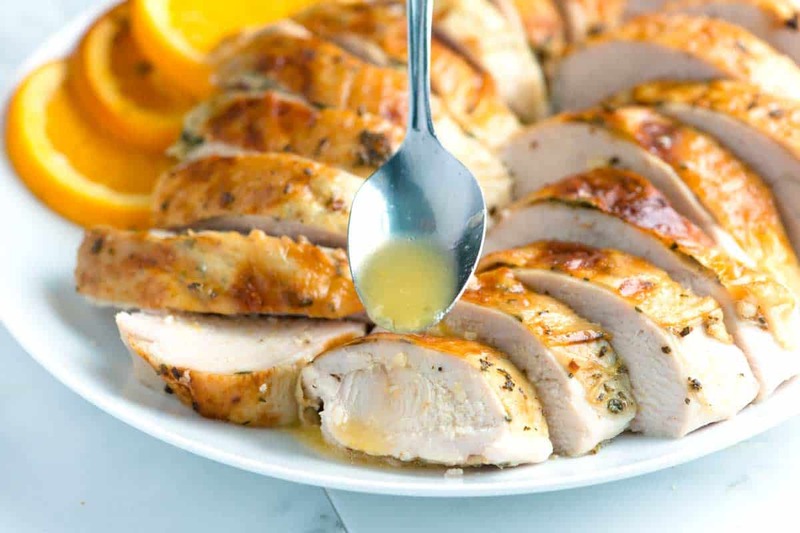 Oranges and olive oil are great with turkey. Jerusalem flavors. Roasted carrots and potatoes are a great side dish here. Even a nice salad with orange slices and Balsamic roasted Brussels sprouts. I always wanted to live in a warmer climate again. I made this meal and it was delicious. A new reason to move back to Jerusalem, the oranges and all of the rest of the wonderful,fresh produce. my family and I lived in Israel when I was a young child. I will always remember my Grandmother’s poppy seed cookies. And who can forget the street carts with Falafel Sandwiches? The best in the world. This looks too good not to make this weekend. It looks incredibly juicy and delicious. made this for mother’s day! so surprised it was soo juicy! loved it! Great! So glad it worked well for you. Wonderful recipe! it came out just perfect. Moist and deliciously seasoned. Thanks! Love this! This got me over my fear of cooking a turkey breast. I’ve made this twice and it came out perfect both times. Thank you!! This turkey looks so moist and flavorful! Can you use this recipe on a full turkey, not just the breast? Yes, the cooking time for a full turkey will be longer. Aww, thank you for writing back so promptly! Happy Thanksgiving to you! We made the recipe, just as printed, with the exception of using unrefined extra virgin coconut oil instead of olive oil, and we roasted it uncovered for 1 hour and 50 minutes, it was a 5 pound, free range, vegetable fed, hormone free whole turkey breast with bone, and it turned out amazing!! So juicy and delicious!!! I also added a little bit of dried sage and thyme to the rub. Wow, it was soooo good! Thanks for the recipe and for making our turkey feast quite tasty and simple at the same time! Will be making again for sure! Great, so happy you both enjoyed it! Happy Holidays! Did you taste a coconut flavor when using extra virgin coconut oil? We’re excited to try this one out tomorrow for Thanksgiving, since it’s just the 2 of us this year while in a vacation rental. Was curious about cooking it uncovered the entire time though, it doesn’t dry out too much? I’m tempted to cover it with foil – but will try it your method and see how it goes! Love your photos, looks yummy! Uncovered is the way to go – if after 1 1/2 – 2 hours the turkey is still not fully cooked in the middle, you can cover. By cooking uncovered the skin becomes golden brown and holds in all the turkey juices.